..and sample the handmade chocolates and other delights inspired by wise words from the local generation born between 1925 and 1935, as part of the Trading Wisdom art event on Inverkeithing High Street running between 10th – 17th October. In each of the 10 collaborating shops, Rosie has incorporated a gathered nugget of wisdom into each shop’s trading activity. 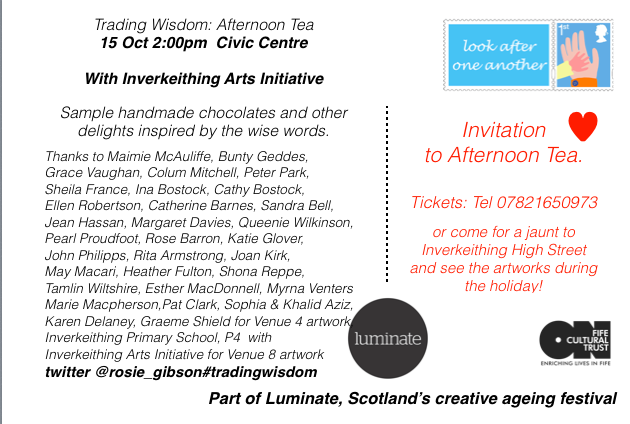 Trading Wisdom is part of Luminate, Scotland’s Creative Ageing Festival. The event is free, but ticketed, so please call Rosie at the number below or email rosiegibson@me.com or online at Eventbrite.